These Utopia Care Professional Thinning Hair Shears are purely made of Japanese 440C stainless steel to reach high durability and thus longevity. Stainless steel is also known as material which resists rust and tarnish, therefore, these shears are easy to disinfect. These hair thinning scissors have two kinds of blades – one blade has 33 micro-teeth, but another blade has smooth razor edge for razor-sharp thinning or texturizing. They are available in three different sizes – 5.5, 6.5 and 7.5 inches, so every barber can choose those which are the most appropriate for their individual needs and wants. 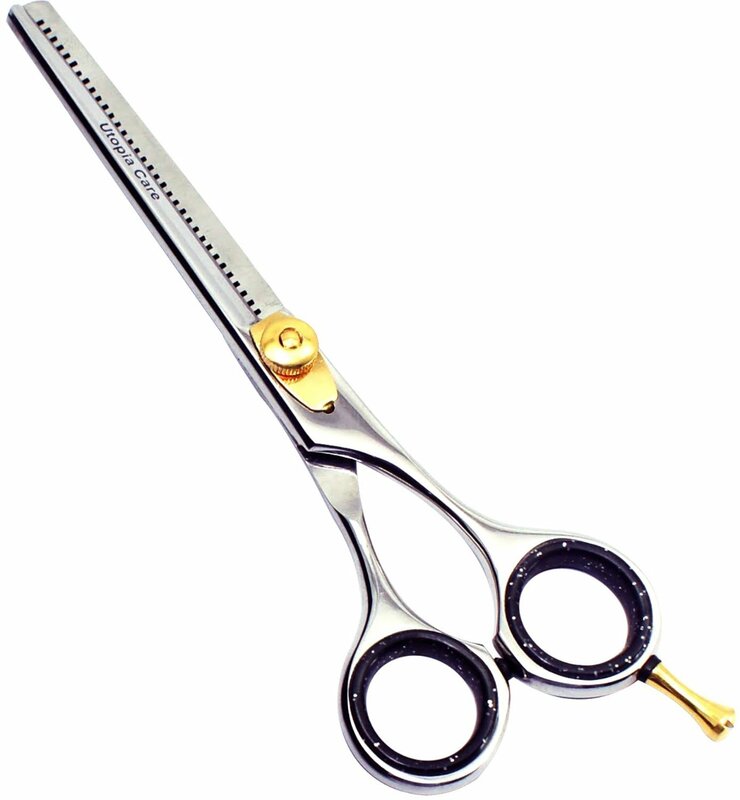 These hair shears have customizable cut, because they are equipped with tension adjustment system with knurled knob, therefore, they can be adjusted for necessary tension. Another feature is finger rest which, if it is necessary, can be removed – it helps to relieve the stress from hands and shoulders, preventing occupational diseases. They also have removable rubber finger inserts which are intended for size adjustment and comfort. This Utopia Care product comes with synthetic leather storage case, so it can be safely and comfortably moved. These Utopia Care hair texturizing scissors are silver color with polish finish, but elements such as finger rest and tension adjustment knob are gold color. It should be mentioned, that this is not simple tension adjustment knob – it is spring leaf tension adjustment system with knurled knob. Their rubber finger inserts are black with silver color glitter. They also have Utopia Care name on blades. These hair thinning scissors come with zippered, cushioned, black synthetic leather storage case to preserve shears and prevent accidents. This Utopia Care product is meant for hair thinning and texturizing or, in other words, for reduction of hair bulk and for making of special hair texture. As these hair shears have all of necessary qualities, but at the same time they have low price, they are suitable both for professional barbers and hairdressing students – they can be used in barbershops, in schools and in households. Utopia Care Professional Thinning Hair Shears are intended for hair thinning and hair texturizing. These hair shears are made of 100% Japanese 440C stainless steel for high durability, longevity and sterility. They have 33 micro-teeth on one blade and smooth razor edge on other blade. They are available in three different sizes – 5.5, 6.5 and 7.5 inches. They have modern and stylish look – they are silver color with polish finish and they also have gold plated elements such as finger rest and spring leaf type tension adjustment system with knurled knob. Their black rubber finger inserts with silver color glitter can be inserted or removed to adjust the appropriate size of finger holes and improve sense of comfort. They also have removable finger rest which helps to relieve the stress from hands and shoulders, preventing stiffness, aches, pain and cramps. This Utopia Care set includes not only thinning / texturizing scissors, but also synthetic leather storage case for safe and comfortable movement. Both professional hairdressers and hairdressing students can thin and texturize hair with this tool.